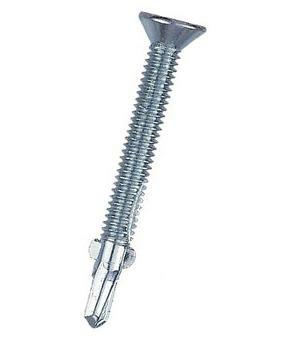 PRODUCT: #12-24 X 2 inch Flat Head TEK Screw with Wood Drilling Wings, #2 Phillips Drive, #3 Drill Point TEK, Zinc Plated. For attaching wood to heavy gauge Steel. 2000/Box. Price/Box. DESCRIPTION: Commonly used for attaching wood (7/8" to 1-1/8") to heavy gauge steel (to 0.21"). No predrilling. The hardened point provides penetration of steel substrates. Wings ream hole in wood, then detach when they reach steel. Made from heat treated steel with electroplated zinc finish and comply with SAEJ78 and ASTM C954. For Attaching wood (7/8" to 1") to heavy gauge steel (0.175" to 0.21").